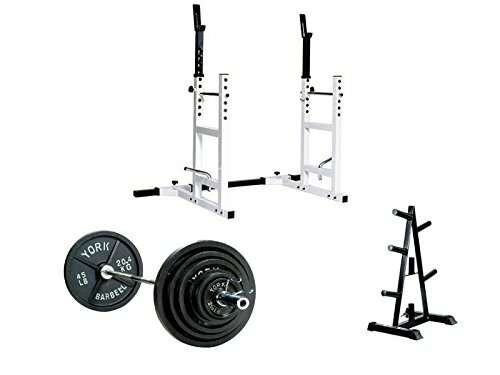 York Barbell has consistently set the standard in product styling, performance and value. It is synonymous with the essence of weightlifting. This high quality 300lbs weight set is perfect for barbell workouts. The adjustable rack works well for bench press and as a squat rack. Barbell Support. Adjustable upright width: 30.5" - 49.5" W, Overall Height - Top to Bottom: 42", Overall Height - Top to Bottom: 64". Overall Width - Side to Side: 30". Overall Width - Side to Side: 64". Overall Depth - Front to Back: 38", Overall Product Weight: 77 lbs, Dimensions: Floor to spotting bar: 26"-36"